Microneedling is a popular procedure that can safely and effectively address multiple skin concerns. Now, an innovative procedure combines microneedling with radiofrequency energy, taking skin rejuvenation to the next level. There are a number of reasons why RF microneedling needs to be your new go-to option for full skin rejuvenation today. The procedure involves penetration of gold plated microneedles into the dermis to deliver high-tension radiofrequency pulse into the targeted tissue. RF microneedling adds the element of radiofrequency energy to the traditional microneedling procedure. The RF energy is delivered via small needles. 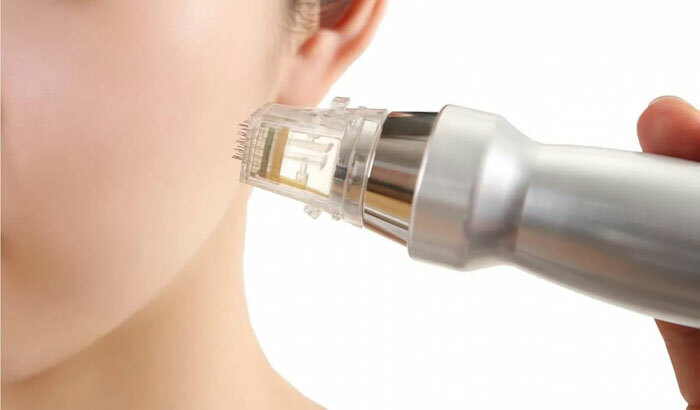 In addition to the benefits seen with the micro-injury provided by the microneedles, RF microneedling also delivers RF energy deep into the dermis further enhancing skin tightening and scar reduction. The RF energy heats the underlying layers, causing constriction and tightening of the skin, as well as the stimulation of collagen and elastin production. Because the RF energy is delivered so deeply, it can produce faster, more dramatic results. Redness disappears within couple of hours and your face will start to feel tighter and more lifted. Even after a first treatment you will see a noticeable difference, it will help both with wrinkles, skin tightening, rejuvenation, reduce pore size etc. The combination of gold plated microneedles and radiofrequency leads to a more substantial improvement in skin quality and texture. This combination also allows the procedure to treat a variety of concerns such as skin tightening and brightening, pore size reduction and stretch marks. It is also effective in scar treatment such as deep acne scars, ice pick scars, atrophic scars, burn and operation scars. Fine lines and facial wrinkles. Scarring from acne and chicken pox. Mild to moderate skin laxity. Irregular skin texture and tone. Shorter procedure time and downtime. Lower risks such as post-inflammatory hyperpigmentation and scarring.